Silage is a staple in many livestock rations. However, if not fermented properly, silage can lose valuable energy, protein and fiber components that are often destroyed during the ensiling process. BioZyme® Inc. has developed a natural silage additive called AmaSile™ which is scientifically formulated to reduce the time required by silage to properly ferment, minimize nutrient loss and reduce spoilage by undesirable bacteria. In ideal conditions, lactic acid bacteria grow rapidly by utilizing the sugar in fresh forage. These bacteria are very efficient and quickly use the sugar to produce lactic acid. The production of lactic acid lowers pH levels of silage and protects it from unwanted microbial growth, such as molds and Listeria monocytogenes during fermentation. AmaSile contains metabolites produced from a proprietary fermentation product, and, unlike silage inoculants, does not contain live microorganisms and therefore remains stable throughout storage and application. According to a research trial conducted by Dr. Chlou Keh-Ming of National Chung Hsing University in Taiwan, cows fed corn silage treated with AmaSile during the summer exhibited greater dry matter intake, an average milk increase of 3 lbs., and increased weight gain than the control group fed untreated silage. The winter trial showed lower dry matter intake with 3.5 lbs more milk and increased weight gain. Corn silage treated with AmaSile also exhibited a lower pH, a higher percentage of lactic acid, a lower percentage of acetic and butyric acids, decreased NDF (Neutral Detergent Fiber) and ADF (Acid Detergent Fiber), and a higher percentage of crude protein and protein fraction A, according to the trial results. AmaSile can be used on any forage, in any storage area including piles, bags and pits. The recommended application is 1 ounce per ton of treated silage. AmaSile is available in a 2.5 gallon size, which can treat up to 320 tons. 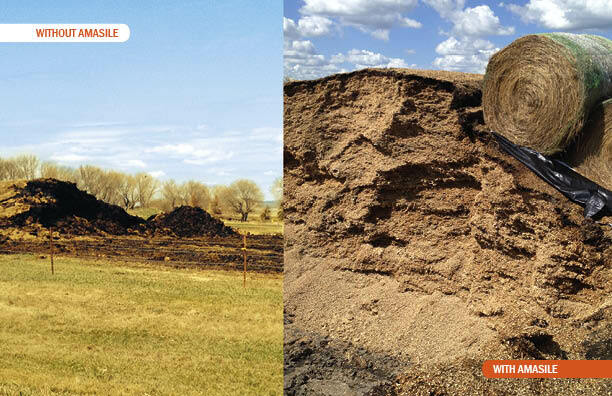 Cory Burkle of Burkle Ranch in Fredonia, ND used AmaSile on his 2014 silage, but didn’t realize how much of a difference the product made until he compared it to his 2015 pile, which he did not treat with AmaSile. For more information about AmaSile, visit www.vitaferm.com/products/amasile/.